FULTON, NY – The city of Fulton paid tribute Wednesday night to the outstanding members in the fire and police departments. 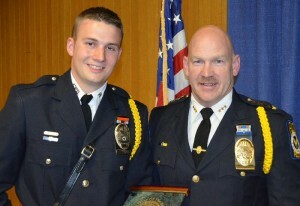 Officer Jarrett Marino, the Officer of the Year, poses with Chief Orlo Green, right. They began with some service awards. An attendance program for the fire and police departments recognizes those employees who have completed two consecutive years of service without an absence. 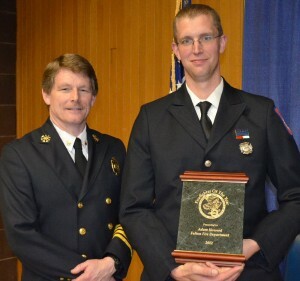 Firefighter of the Year Adam Howard. Every year the Fulton Police Department participates in the Selective Traffic Enforcement Program or “STEP” program, which is funded through grants provided by the Governors Traffic Safety Committee. This program targets traffic offenses like red light, stop sign, unsafe lane change, and failure to yield the right of way just to name a few. These offenses are indicative of driving behaviors that cause the majority of accidents which occur in the city. Leading the department for the year was Officer Jarrett Marino followed by Officer Lucas Hollenbeck and Officer Christian Dempsey. Back in 1982, when you turned on the radio “Physical” by Olivia Newton-John was the number one song, Ronald Regan was your president and the movie ET the Extra Terrestrial was the number one movie in the land. That same year, the city of Fulton fire department purchased a new fire truck. But as with any new vehicle, they don’t last forever. When the city gets a fire truck they run them as long as they can, as the replacement cost of a fire truck is staggering, Abelgore explained. But after 30 years in service, it became a reality that this truck would need to be replaced as it was constantly broken down and out of service. With that in mind the city started looking for grants that would help offset some of the cost. Starting in 2008, the city applied for grants to help with replacement costs and each year they were turned down. Not to be deterred, Captain Daniel Abell with the assistance of city employee Joann Cavalier looked into the process trying to determine why they were failing to obtain funds and how they could change things up in the application to have a better shot at some much needed financial aid. For their hard work and dedication which made the acquisition of this new truck possible, Captain Abell, who just retired March 31, and Cavalier were presented with the Honorable Service award. Last June, Officer Lucas Hollenbeck was on patrol on the city‘s west side when he noticed that the car in front of him had its left turn signal on. Normally this wouldn’t be a problem, but the intersection he was approaching was clearly marked no left turn. So, when the car made a left, he quickly activated his lights and made a traffic stop. When Hollenbeck approached the car he spoke to the driver who stated he was on his way to a concert in Sterling. While speaking with the driver Hollenbeck was scanning the interior of the vehicle when he noticed a glass pipe sticking out of the vehicle’s console. Suspecting the pipe was for marijuana use, Hollenbeck asked the driver and he confirmed he uses the pipe for smoking pot. During a subsequent interview the passenger admitted that the bag was his and admitted that the bag did indeed contain hallucinogenic mushrooms. Both the driver and passenger were arrested and when the vehicle was later inventoried prior to being towed a second stash of drugs consisting of cocaine was located in the back. Both the driver and passenger were subsequently charged with various misdemeanors and a B felony. 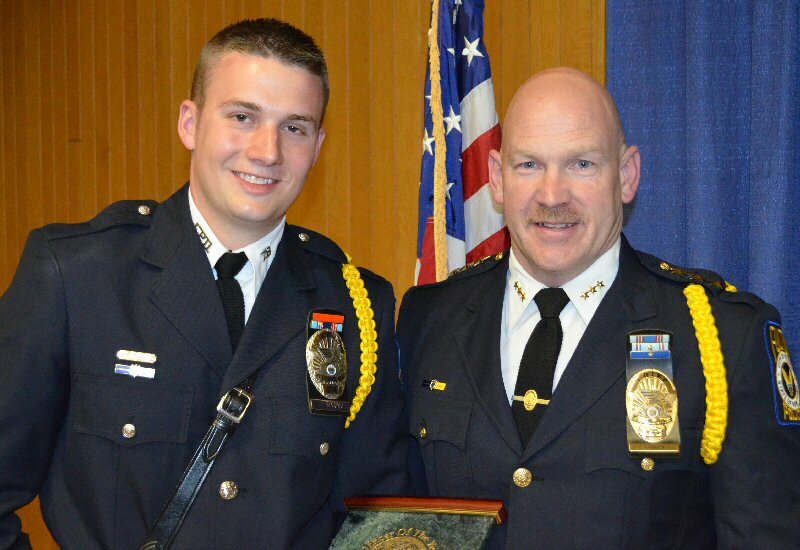 “For his alert proactive work on what started out as a routine traffic stop but ended with taking dangerous drugs off of the streets, we recognize Lucas Hollenbeck with the Honorable Service Award,” Abelgore said. In the early part of summer last year, the city of Fulton experienced a crime wave. Houses and business were getting broken into and property was getting stolen. This included a large amount of bath salts which at the time were legal to posses and sell. “Sadly, this type of activity is not that uncommon here in New York State. Then the stakes went up when there were two separate crimes reported that really emphasized the dangerous nature of the criminals involved in this particular crime wave,” Abelgore said. A man on the city’s west side called to report that an unknown man had just broken into his house demanding the victim turn over a gun to him that the suspect believed was at the residence. According to the victim, the man struck him several times with a small bat or club while demanding the property. The burglar eventually left empty handed after assaulting and terrorizing the resident. A couple of weeks later, a patron of a local business walked out to her car when she saw a man in her vehicle rummaging around. She confronted the man who jumped out of her car, pushed her to the ground and threatened to kill her before fleeing the area. With the number of crimes climbing and becoming more and more violent, Investigator Michael Batstone took up the cases. Batstone started pounding the pavement talking to informants reviewing the cases and eventually he developed two suspects. Once the suspects were identified Batstone worked diligently to build a case against them. “Batstone eventually tracked down both suspects and got them to come in for an interview. After multiple interviews suspects Joseph Fetkiew and Peter Maliszewski admitted to their roles in multiple felonies including the ones described here today,” Abelgore said. Further, they pointed out and admitted to several burglaries of houses that the owners had not even been aware of and had gone unreported. Both were eventually sentenced to seven years in state prison for their crimes. Although many members of the Fulton Police Department contributed to the investigative process, Investigator Batstone’s work really stood out. “For his outstanding work that led to the arrest and conviction of two very dangerous criminals who terrorized our city we recognize Investigator Michael Batstone with the Gallantry Star,” Abelgore said. Last November, EMS was dispatched to a routine illness call. EMS members arrived where they found a man who was responsive but complaining of chest pains. The man stated he just knew something was wrong. Based on his symptoms it was decided the man would be transported to a Syracuse Hospital, and its a good thing they did, Abelgore added. A short time after leaving the city the patient went into cardiac arrest. EMT Michelle Rockwood was in the back of the ambulance assisting the patient when he became unresponsive. She immediately went into action. Driver, EMT Garrett Hauf pulled the ambulance over and radioed Menter to send an additional ambulance to help. Hauf jumped in the back and together they began life-saving measures. CPR was started and a defibrillator was used but the patient was still unresponsive. A second ambulance arrived and EMT James Webster and Tracie Desantis came aboard to assist. As they were closer to Oswego a decision was made to turn around and head north while EMTs continued to work on the patient in the back of the rig. Amazingly the patient was shocked with the defibrillator 10 times during the dash to Oswego Hospital and in the end their effort paid off. “The patient survived and still living right here in Fulton. For their dedication, determination and in this instance life-saving efforts, we recognize Michelle Rockwood, Garrett Hauf, James Webster and Tracie Desantis with the Life saving Award,” Abelgore said. Way back in the beginning of 2011, Investigator Aimee May received some information that a guy named Jason Puma was selling large amounts of marijuana in Fulton, Abelgore noted. With nothing to go on other than word of mouth, she began looking into these allegations. After reaching out to informants, police contacts and doing extensive surveillance enough information was gathered to justify a search warrant of Puma’s residence in the town of Palermo. With the assistance of other FPD personnel as well as members of the Oswego County Sheriff’s department and the New York State Police, a search warrant was executed at Puma’s residence where about four pounds of marijuana and a large amount of cash was seized. Puma was eventually charged and in the early part of 2012, he pled guilty to drug charges and was sentenced to 1 ½ years in state prison. “For her work that shut down a substantial marijuana dealer in the city of Fulton, we recognize Investigator Aimee May with the drug buster award,” Abelgore said. In December of 2011 a crime was reported at the former holy family church property on the city’s west side. Someone had broken a window and gotten into the building where Sunday school classes were formerly taught. Once inside the suspects caused substantial damage. Windows were broken, paint and floor stripper were thrown everywhere, fire extinguishers were emptied, and property was destroyed including religious items. The cost of the damage was substantial. Officer Victor Kaufman responded to the scene to help gather evidence, but there were no suspects. The next night, the suspects returned broke in and again caused further damage to the property. Many officers were involved in processing and investigating these complaints. But, still there were no suspects. Two weeks later, Officer Kaufman was on patrol during the day, when he saw two young men that looked to be of school age walking on the city’s east side. Believing one or both of the boys should be in school, he made contact with the boys to find out why they were out walking around during a school day. The boys confirmed they would have had school, but they were suspended. While talking to the boys, Officer Kaufman noticed two things. One, the boys were drinking some type of alcoholic beverage out of a soda bottle and two, the shoes they were wearing had a very distinct pattern on the bottom when they walked that the officer was sure he had seen two weeks before while processing the burglary at the church property. Kaufman began asking questions about the boys’ possible involvement in these past burglaries and it became quickly evident they had knowledge of these crimes. He called for assistance and both young men were interviewed. One of the boys eventually admitted that they were the people responsible for the burglaries and damage to the building. Both males along with several other people involved were arrested and successfully prosecuted for their crimes. In February of 2012, a burglary was reported on the city’s east side. Several thousand dollars worth of property was stolen. This by its self is bad enough but included in that property were three guns. Although a through investigation was done there was little to go on. Several patrol officers worked on the case developing leads which eventually lead to a single suspect Ricky Hart. Members of the city of Fulton Criminal Investigation Division got involved and located the suspect along with the people that were witness to the crime. The suspect eventually admitted to the crime including the theft of the firearms. The problem was Hart had since sold the guns. Again the criminal investigation division worked hand in hand with patrol and the guns were eventually located having changed hands several times before police could catch up with them. Unlike this year, spring came early in 2012. So last April there were a lot of motorcycles on the roadway early in the spring. Officer Brandon Harris was on patrol on the city’s west side when he came upon an accident that had literally just occurred seconds before right in front of the city’s west side fire station. The accident involved a motorcycle and a car and the motorcycle rider was down in the middle of the driving lane. Officer Harris went into action using his patrol vehicle to block the driving lane and protect the downed motorcycle driver. He went to the operator, Chris Castiglia, who was conscious but had obvious extensive injuries. Officer Harris called in the accident and recognizing the extent of the Chris’s injuries requested an ambulance and a helicopter for transport. He then began supporting the Chris’s head and neck speaking to him trying to keep him calm. Firefighters Bill Marshall and Matt Shaw and Captain William Moloscon heard the commotion in front of the firehouse and immediately responded. Firefighters Shaw and Marshall began providing immediate first aid while Captain Moloscon took command. FFD Rescue and Menter’s ambulance arrived on scene and Firefighter Michelle Lacey along Paramedics Stephan Sant and Alex Stevens took over patient care helping to stabilize the patient for helicopter transport. With Chris as stable as he could be given the extent of his injuries he was loaded on the helicopter and transported to Syracuse where he eventually recovered from his significant injuries. “The cooperative effort and outstanding work by all of the first responders involved in this incident surly helped prevent a tragedy. For their efforts we recognize Officer Brandon Harris, Captain William Moloscon, firefighters Michelle Lacey, William Marshall and Matt Shaw along with EMT Sephan Sant and Paramedic Alex Stevens with a Unit Citation,” Abelgore said. Many things can be said about this individual. Since he joined the department in February of 2000. His presence can be felt whether he is on a tour at a local business, in a classroom setting, or at the scene of an emergency. He regularly demonstrates his versatility as he is just as comfortable working on department apparatus (barring strobe lights) as he is standing in front of a classroom instructing. He raises the bar for dedication to service and is always one of the last to leave the fire ground. He has been and continues to be an asset to the Fulton Fire Department and this is shown especially through his consistent and tireless efforts to advance the departments EMS program with the Pilot Program. The department is very proud of his hard work and commitment through which he will now become the second two time recipient of this award. It is with great appreciation for his efforts and dedication to the city of Fulton, the Fulton Fire Department and his fellow firefighters, that we present the 2012 Firefighter of the Year award to Adam Howard. Our Police Officer of the Year has been a member of the city of Fulton Police Department for three years now. During that time he has quickly established himself as an extremely self motivated police officer. This officer has regularly led the department in traffic enforcement and arrests since the day he started his career and you have already seen him receive awards tonight for his exemplary actions. Recently, this officer was selected to be the city of Fulton Police Department’s newest K-9 handler and is currently in training with his new K-9 partner. Our Police Officer of the Year has continuously showed his willingness to go above and beyond putting 100 percent effort into everything he does. He is a hard-working dedicated officer who approaches every case with a positive attitude and willingness to do a through job and he has quickly established himself as an asset to our community. For his hard work, dedication, and commitment to the city of Fulton Police Department and the residents of our community, it is an honor to recognize Jarrett Marino as the Police Officer of the Year for 2012.